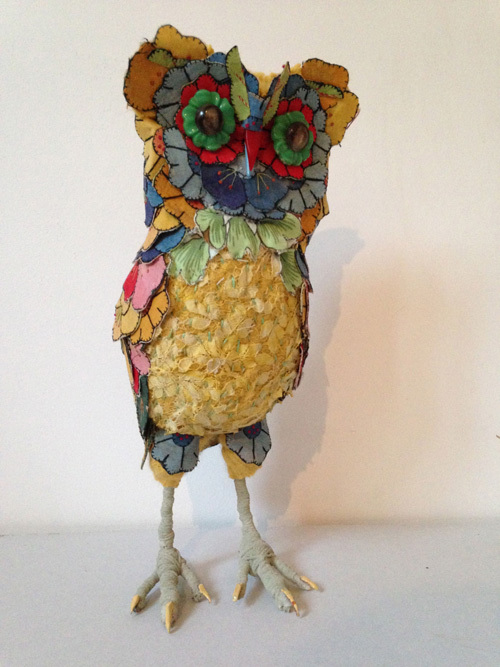 I came across this wonderful owl pouch tutorial by Jill who is passionate about sewing and creating things using recycled materials. 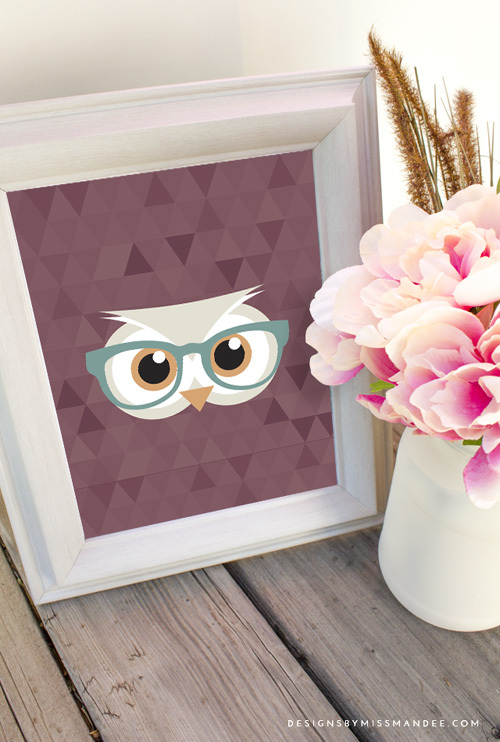 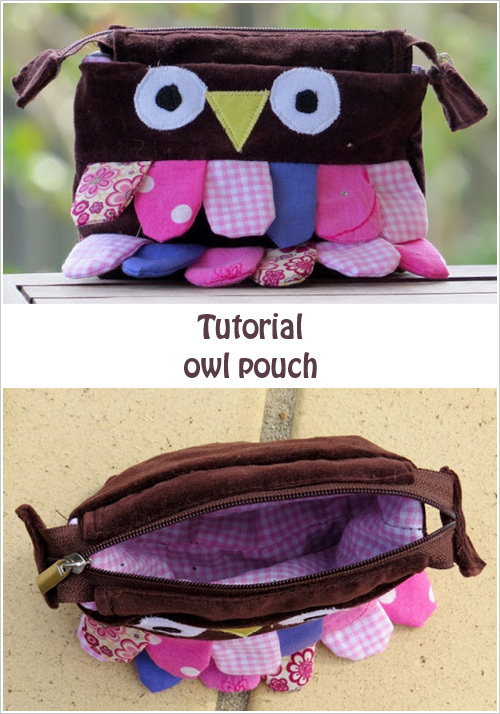 The adorable owl pouch tutorial is simple to follow with the help of easy step by step instructions along with the images. 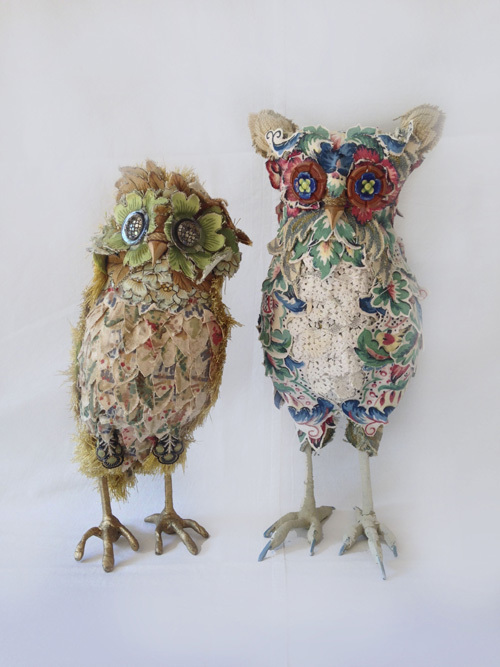 To make the owl pouch you will need only a couple of things like fabric scraps and a sturdy zip. 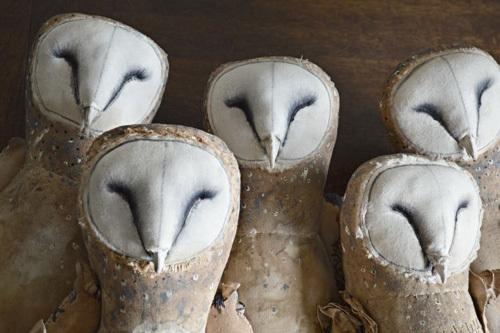 The owl pouch is perfect to store make up, pens or to give as a gift for someone who loves handmade things. 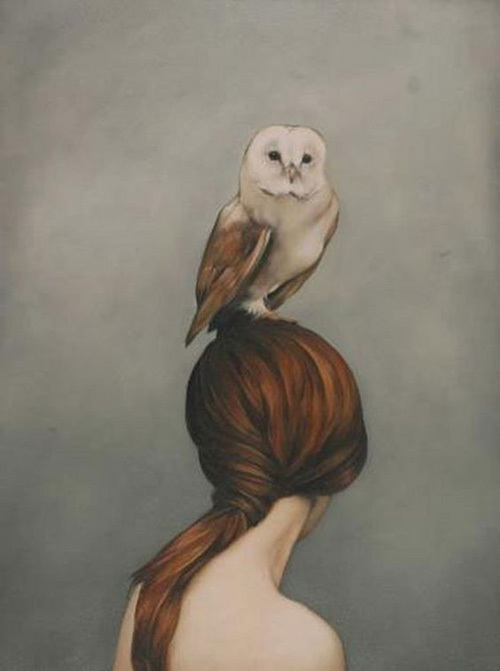 There are some artists who make my hair raise on the end. 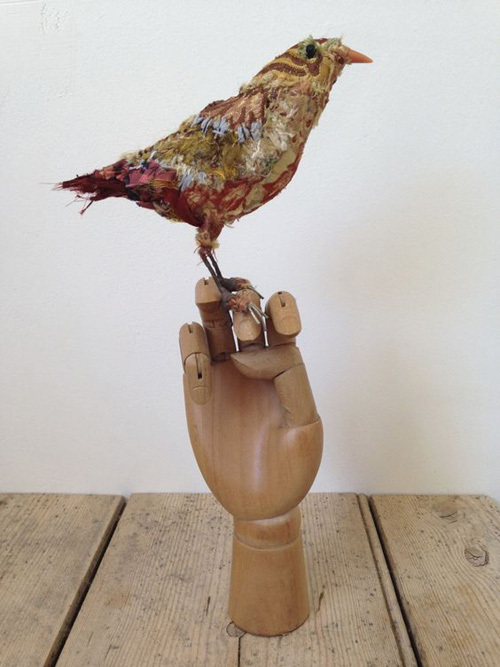 Renowned and a very talented UK based artist Mister Finch is one of them. 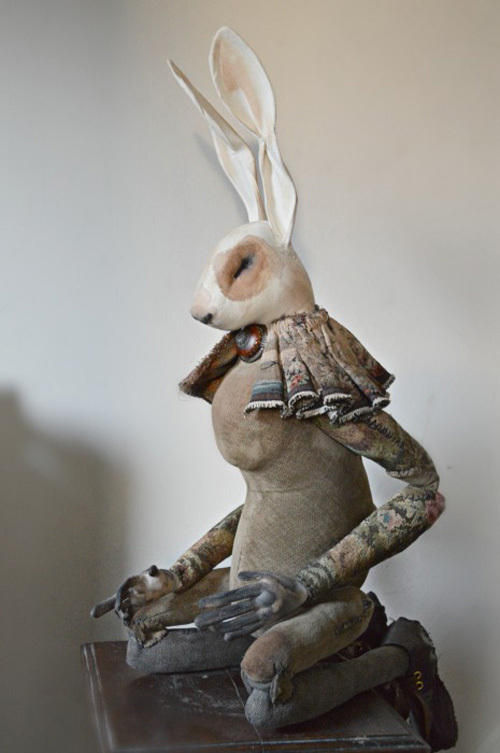 I have been a long time admirer of his beautiful sculptures. 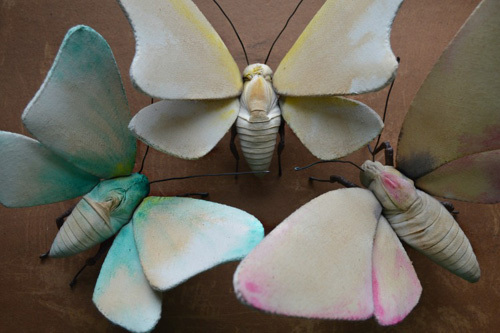 He makes these large-scale stunning animal sculptures from cotton fabric that's aged and painted by the artist himself. 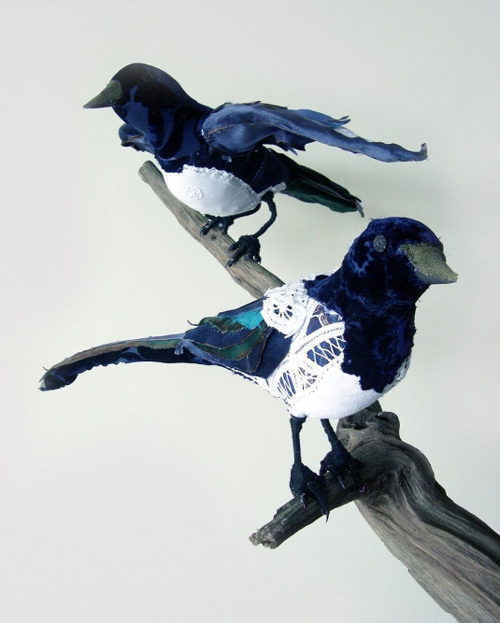 They are dressed in clothes that are folded, pleated and embroidered. 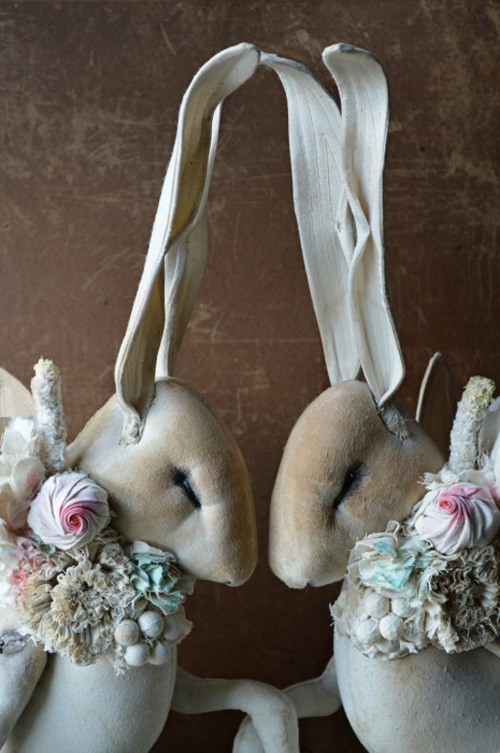 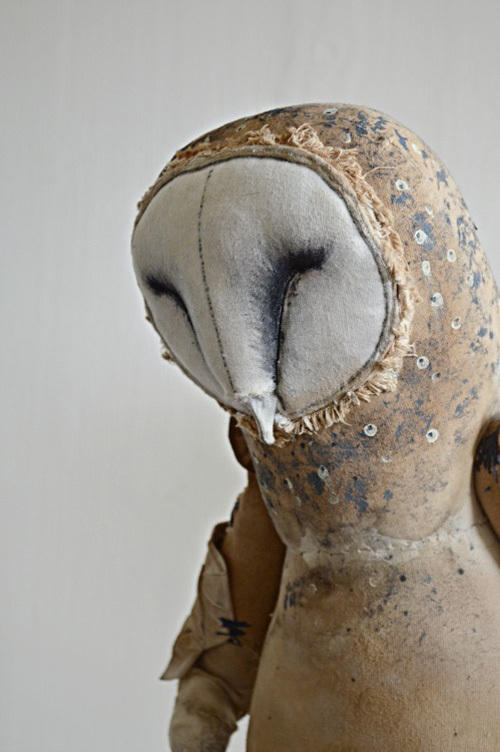 The owls, rabbits, butterflies, moths, and mushrooms all have impeccable fine details that it's almost hard to believe that they are cut and delicately crafted from vintage curtains and wedding dresses. 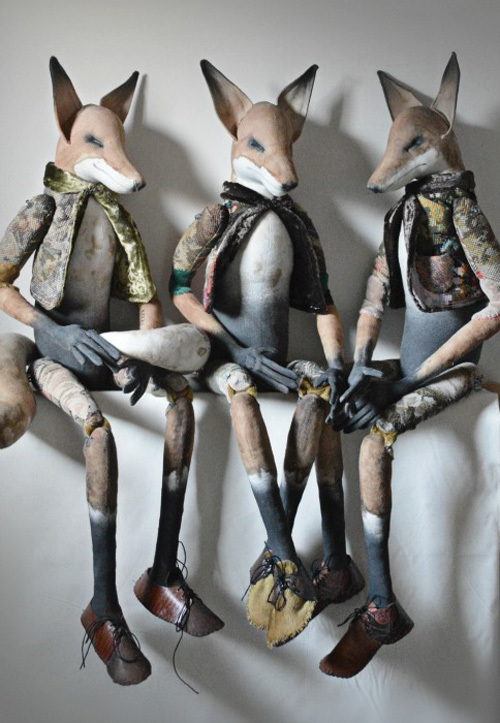 More of his work can be viewed on his website under 'portfolio'. 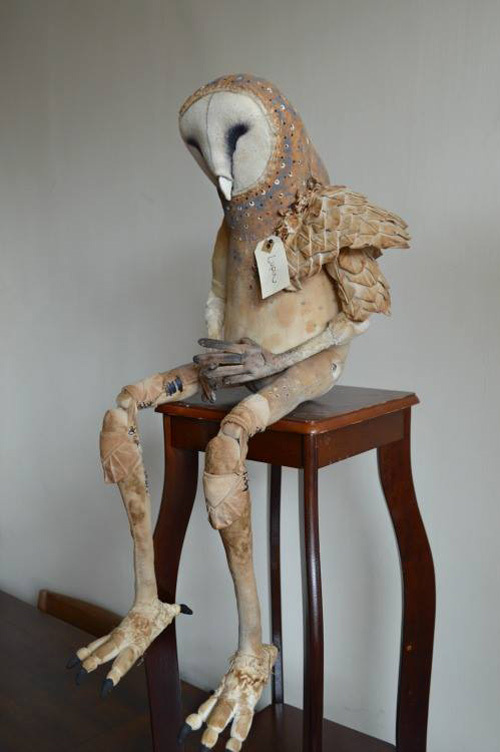 He does sell some of his pieces through his Facebook page, you can find more information on how to buy here. 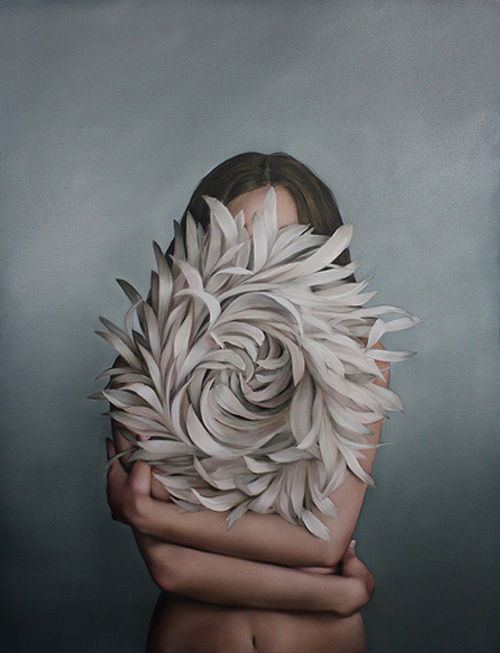 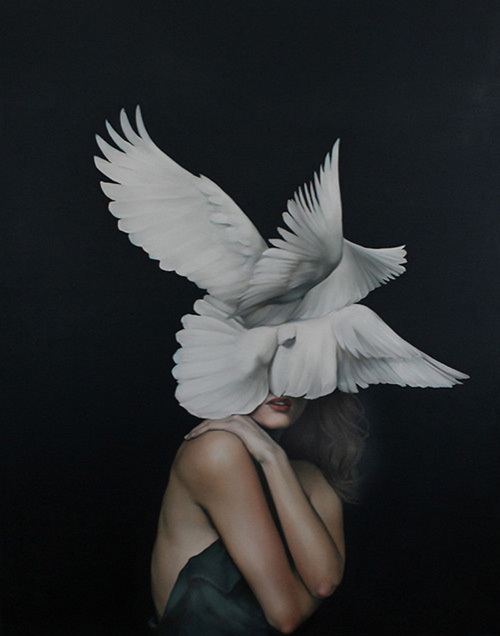 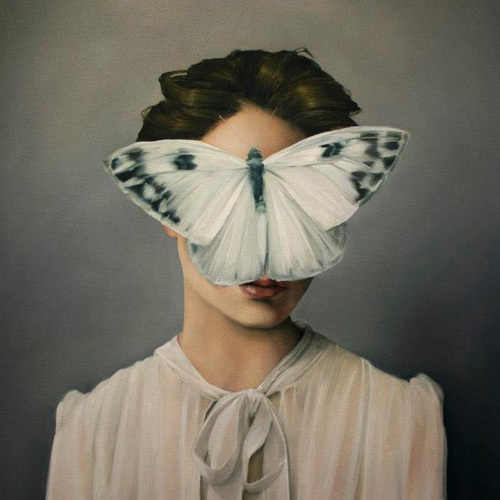 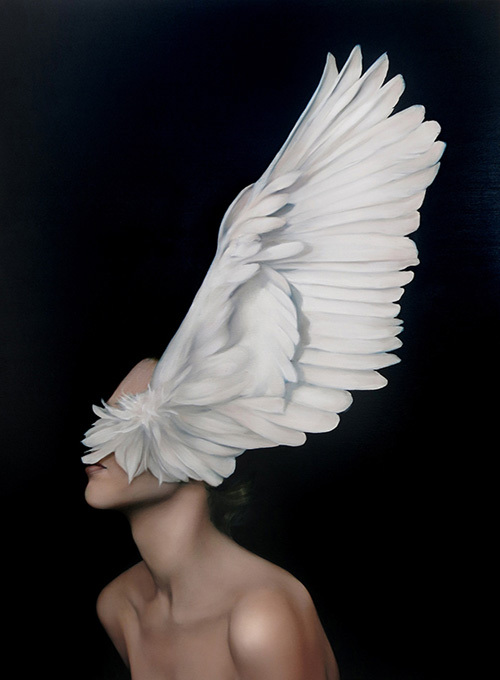 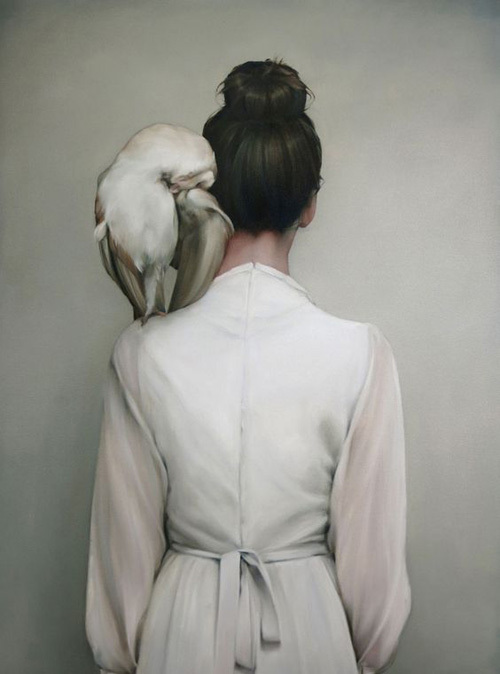 I have featured London based artist Amy Judd's wonderful paintings on the blog previously. 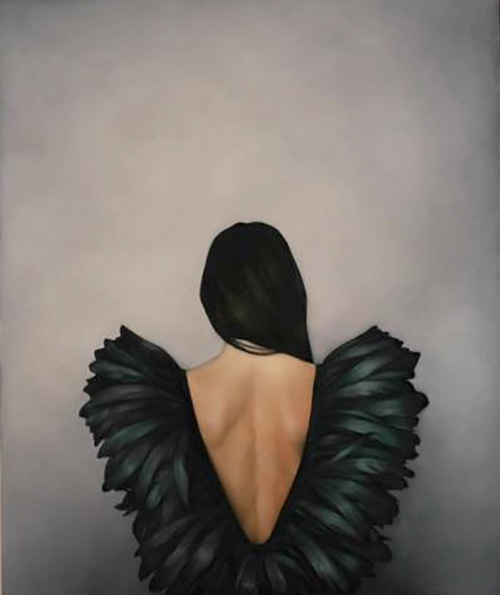 For this post, I've picked out some new paintings by her that must be shared with you. 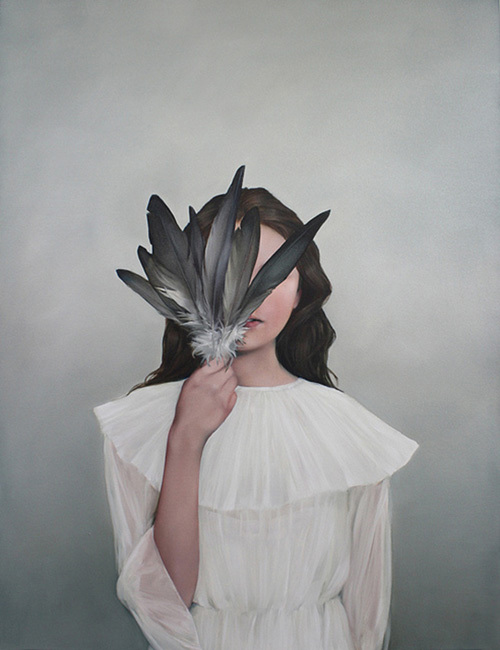 Amy's whimsical work has a mystery woman as the primary subject matter whose face is never shown or is covered with flowers or feathers. 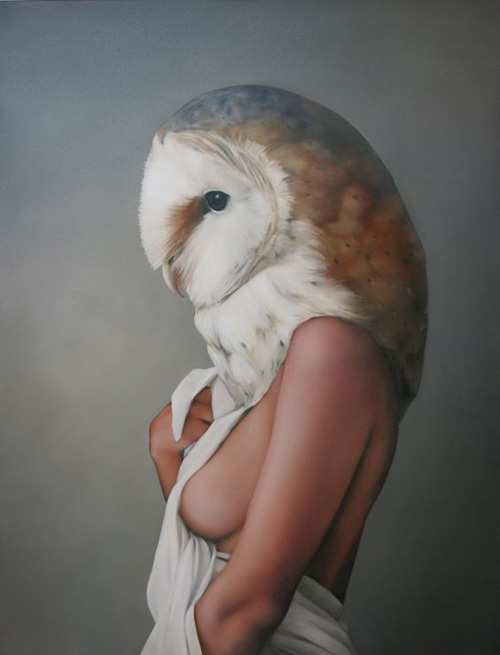 The owl which is time again is painted by the artist is "somehow linked to the sensitive yet strong image of the female figure. 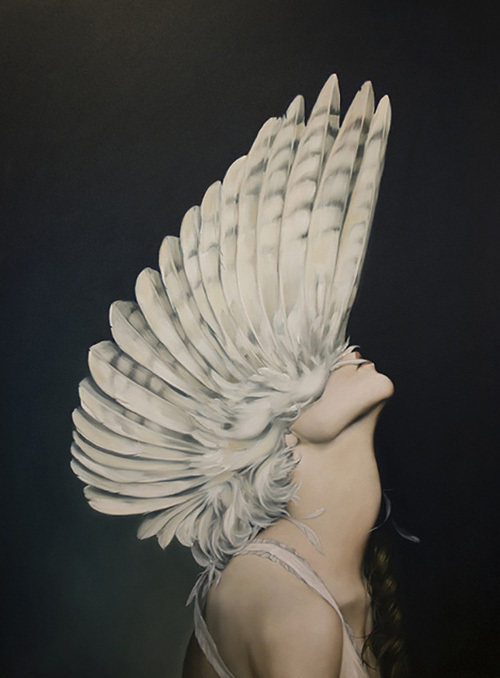 In her imagery she uses feathers and other feminine items as symbols of strength, flight and bravery, rather than fragility"- via. 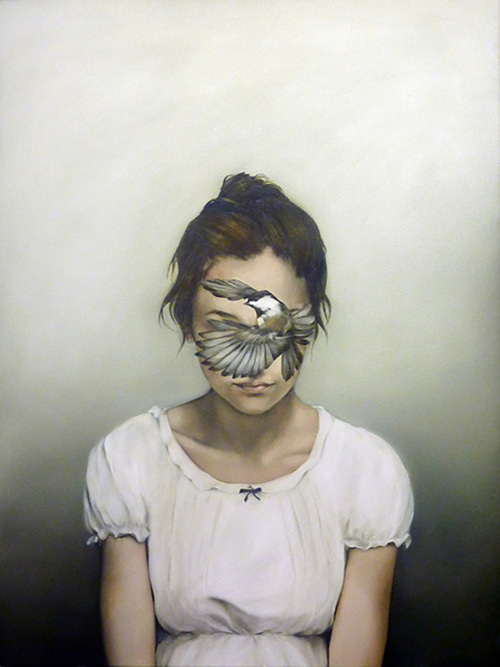 The paintings depict an enchanting relationship between women and birds found in folklores. 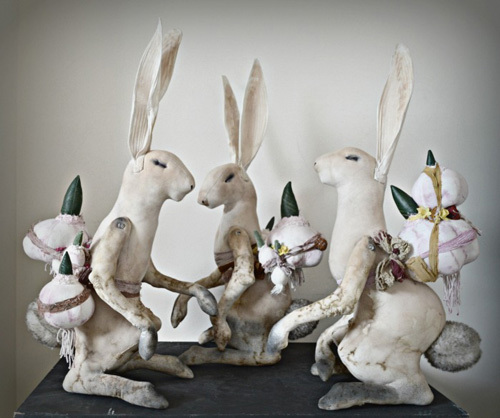 Amy is currently represented by Hicks Gallery where you can find more of her work. 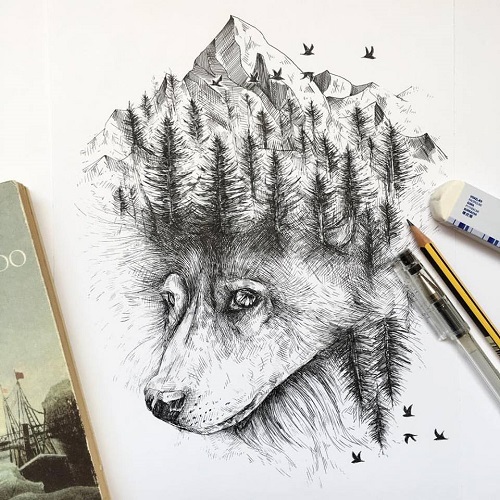 Alfred Basha of Albanian origin is an illustrator based in Treviso, Italy. 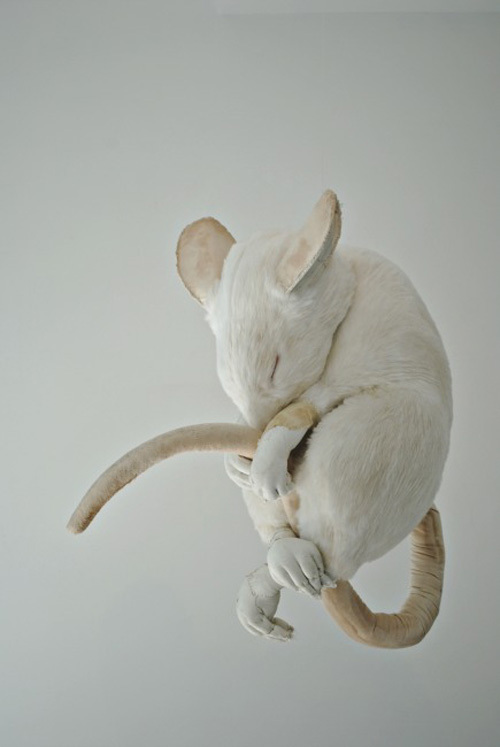 He has studied at the Faculty of Industrial Design IUAV. 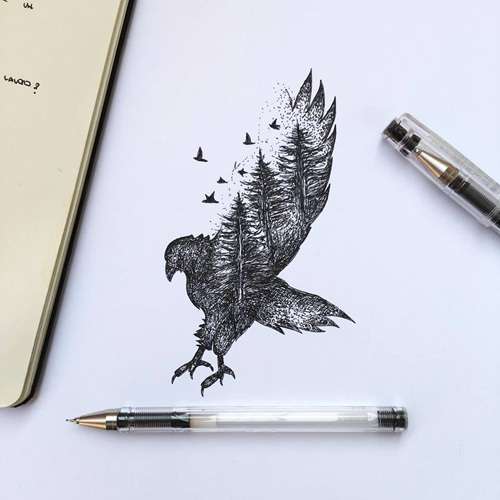 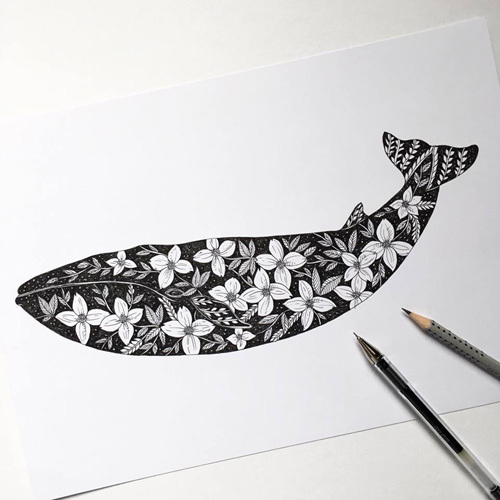 He draws series of animals, birds, plants and objects with Micron black pen ink. 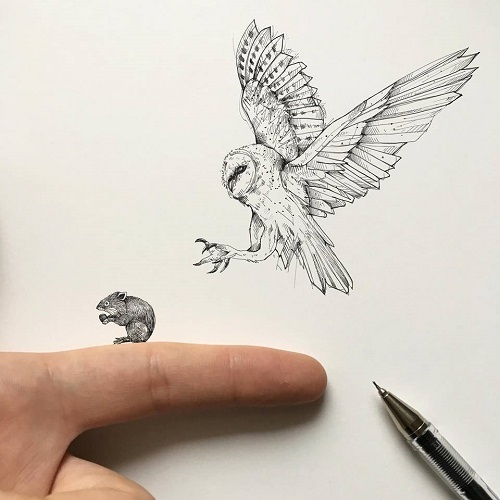 His sketches are mostly an amazing combination of two or more subjects mentioned displaying fantastic attention to details formed with tiny pen strokes. 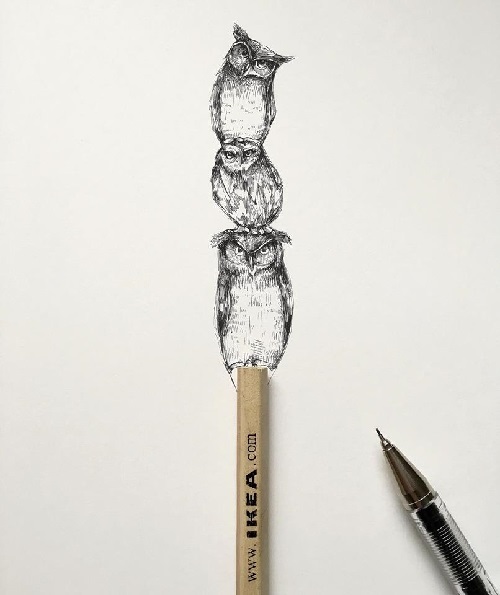 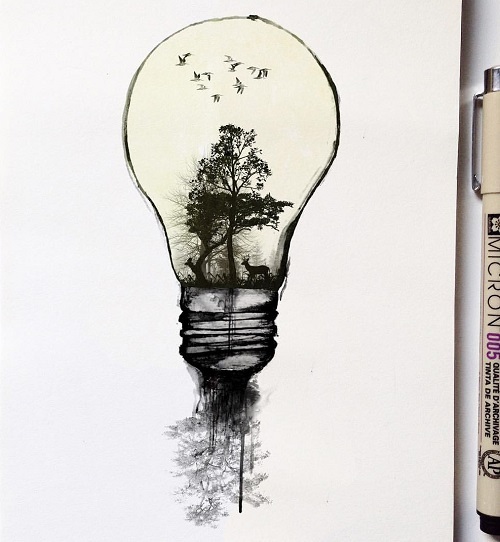 In his drawings the viewers will find encapsulated forest creatures around trees in a light bulb, wolf carrying a mountain on his head and owls stacked on top of each other like totem. 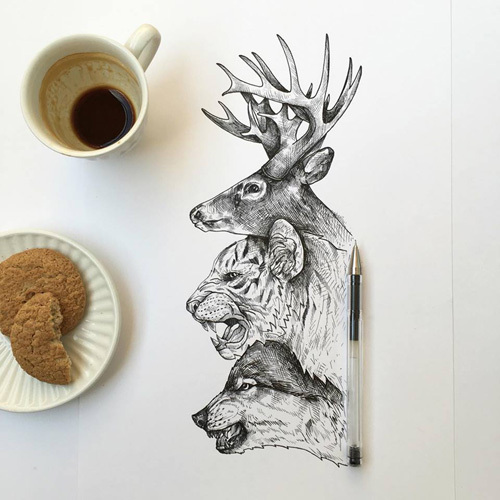 The prints of his drawings can be purchased from his online store. 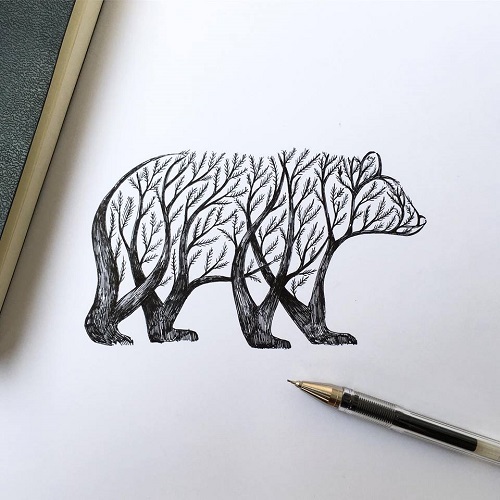 Each print comes signed and numbered by the artist. 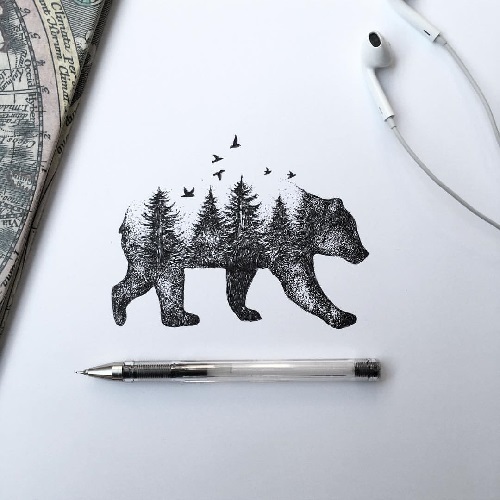 Good morning friends, I hope you had a wonderful weekend. 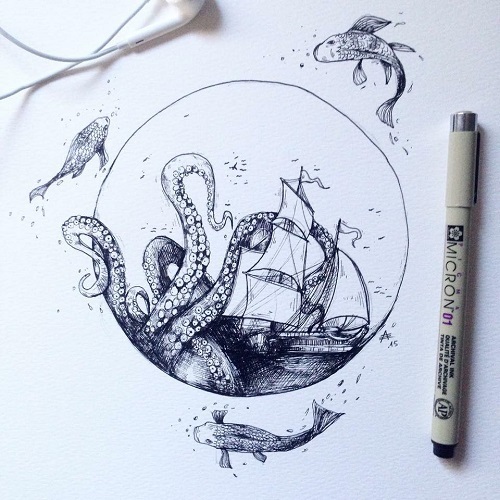 I have a visual treat to start our week together here. 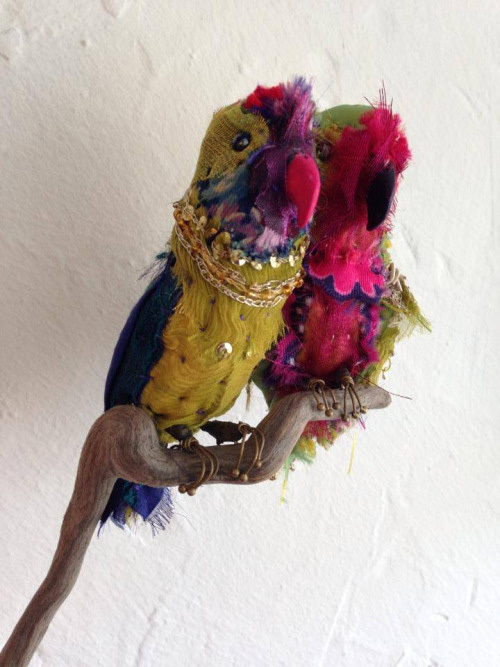 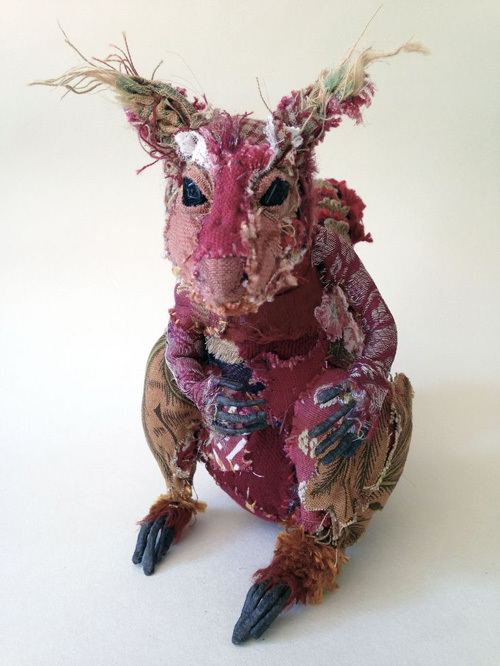 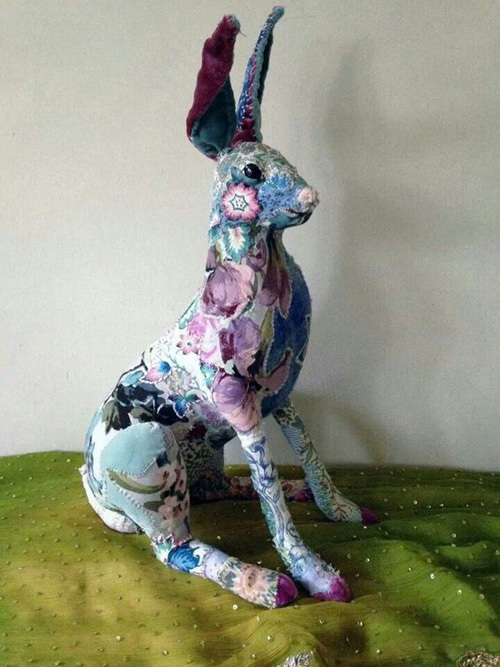 If you have been reading my blog for sometime then you have seen Bryony Jennings' textile menagerie. 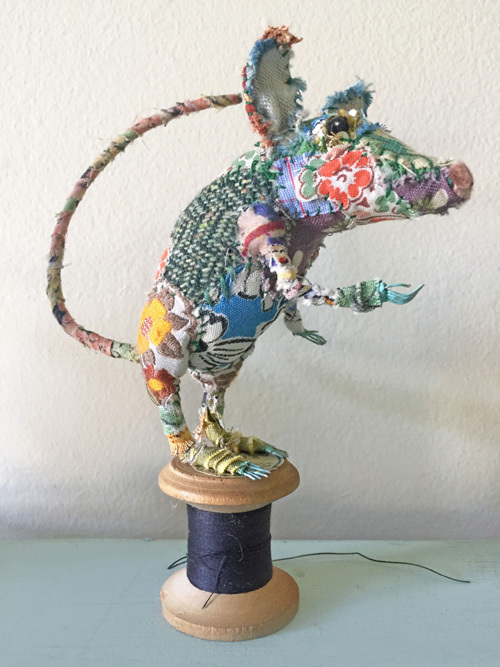 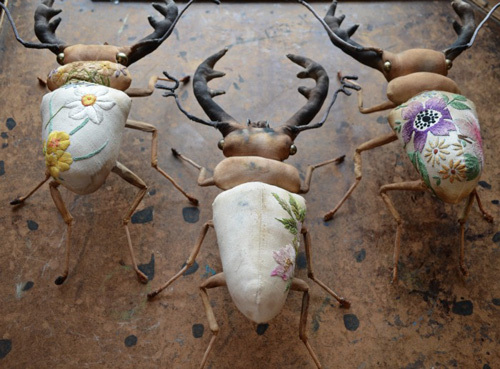 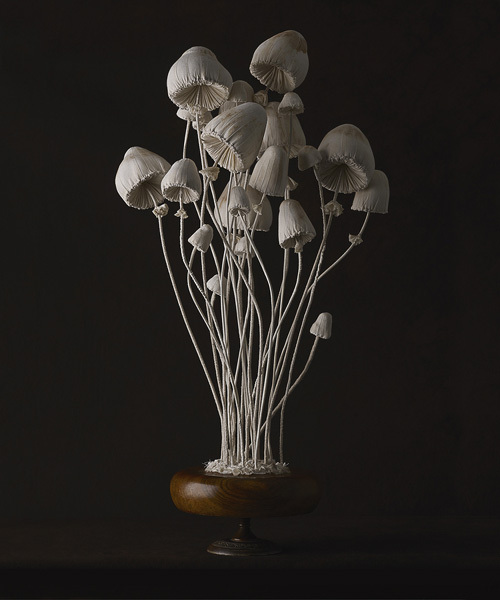 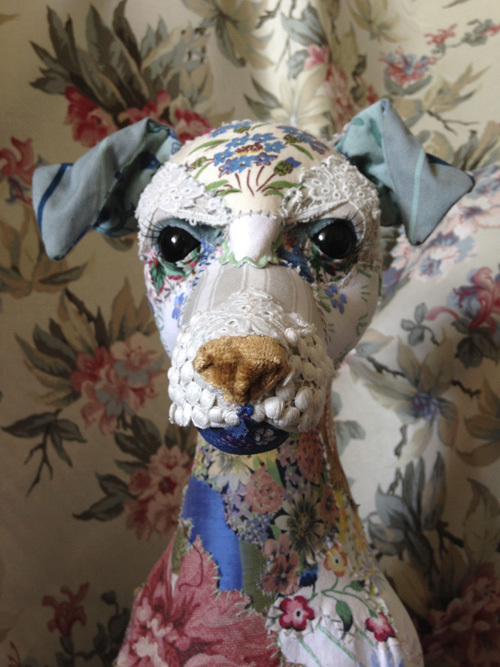 She makes these beautiful sculptures using repurposed vintage textiles, lace and embroidery. 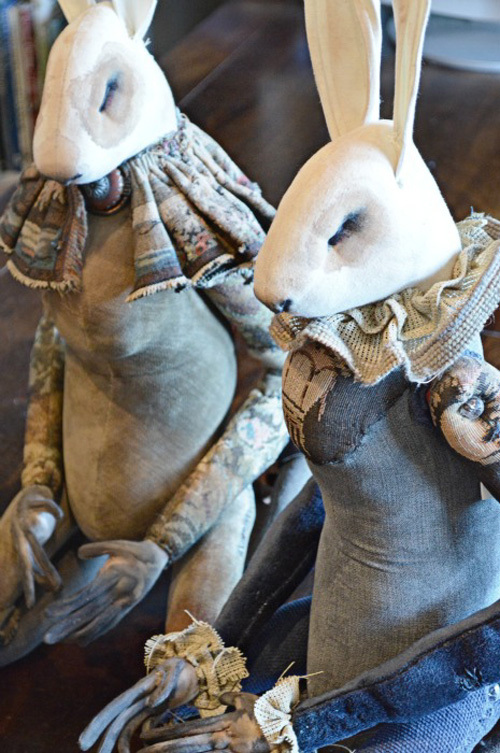 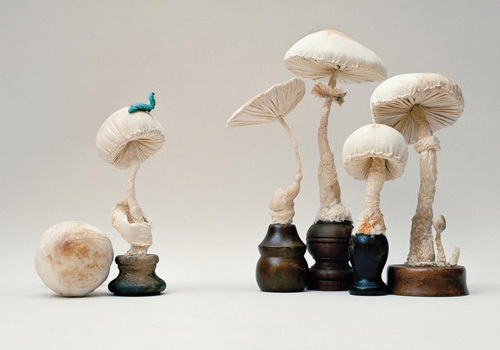 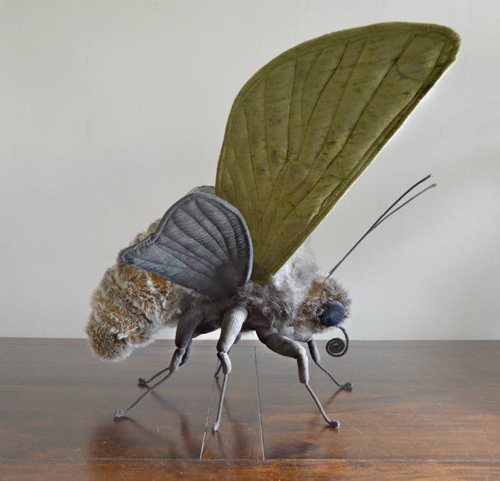 Here are some of her new animal sculptures that will take your breath away. 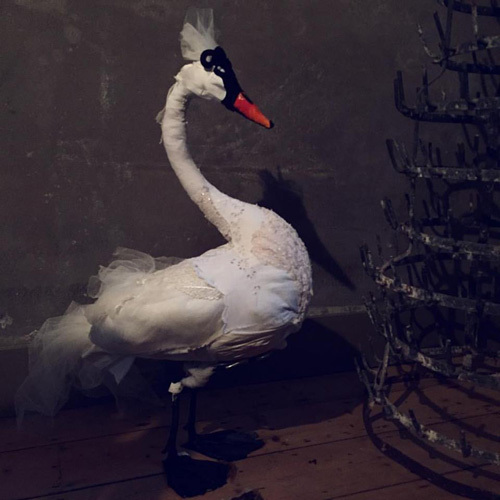 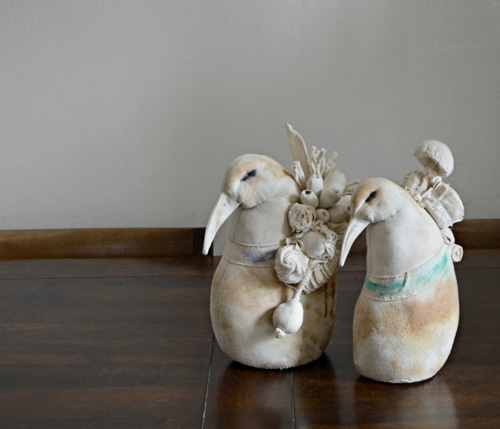 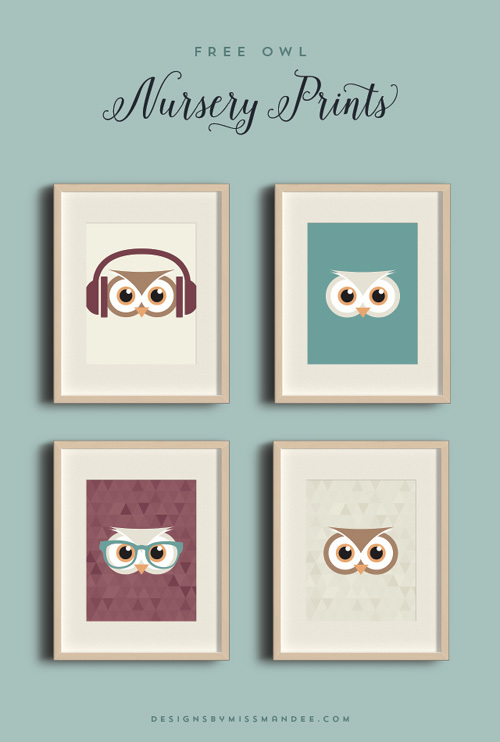 I am swooning over the swan and the pair of owls. 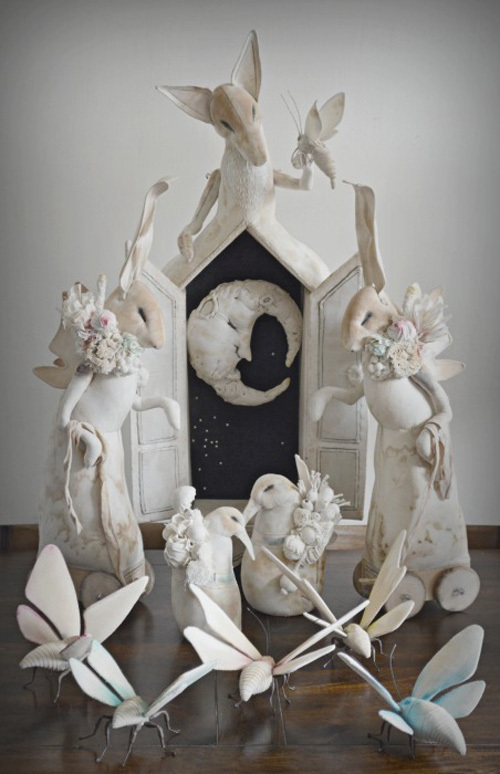 You can join her facebook page to get regular updates and get announcements on her workshops, in case you would like to learn from her. 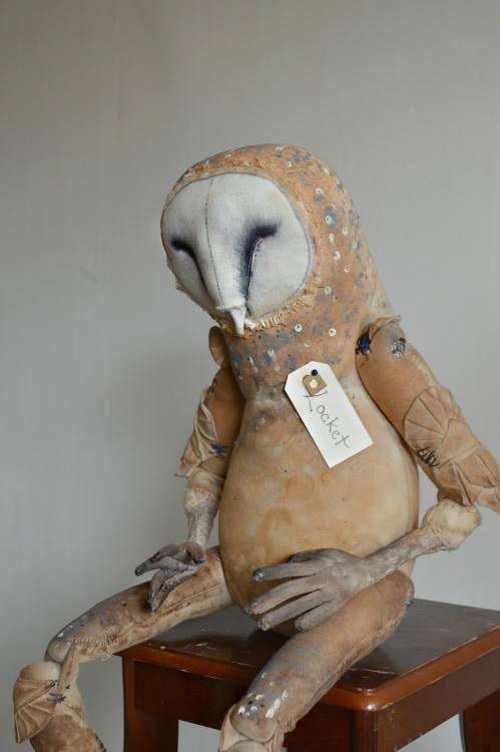 She has a few pieces that are available for purchase here.